Thugs kicked through the door of a property in Ravensthorpe yesterday in one of two attempted burglaries. The two raids, which were both thwarted when the raiders were disturbed by occupants, took place on Queen Street within an hour of each other. CCTV images show thugs kicking through the door of a residential home in Ravensthorpe. A witness said the would-be burglars, described as Asian heritage between the ages of 18-25, were chased out of the second house when they were confronted with a screaming young girl. The witness said they left the scene laughing. 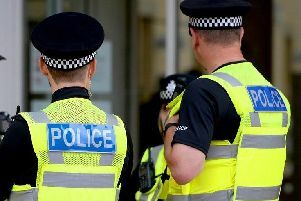 A West Yorkshire Police spokesperson said: "Police are investigating following an attempted burglary at two addresses on Queen Street in Ravensthorpe yesterday evening. "The first report came in at 17.50 and the second came at 18.43. "Suspects left both addresses empty handed after being disturbed. "Enquiries are ongoing into both incidents. Anyone with information or saw anything suspicious on Queen Street yesterday is asked to call Kirklees District CID via 101 quoting crime reference 13180585333 or 13180585199 or use the live chat facility on the West Yorkshire Police website."